Leticia dos Muchangos is a JSPS-UNU Postdoctoral Fellow at UNU-IAS. Her work is related to the development of education programmes for the implementation of the Sustainable Development Goals–the focus being on gender-responsive approaches, for sustainable consumption and production. 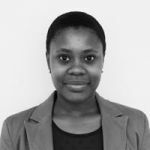 She was awarded a Ph.D. from Osaka University, with her doctoral work focused on the development of effective solid waste management systems in urban centers of low-income countries, with a case study based in the capital of Mozambique. She combined several decision-support and system analysis tools to propose strategies for: development of sound institutions and proactive policies; improvement of stakeholders’ involvement and cooperation; effective structuring of the physical elements of waste systems; and environmental protection and efficient management of resource materials. The results of her work can be found in a number of international scientific publications. Before joining UNU-IAS, she worked as an assistant professor in the Division of Sustainable Energy and Environmental Engineering at Osaka University. dos Muchangos, L. S., Tokai, A., & Hanashima, A. (2017). Stakeholder analysis and social network analysis to evaluate the stakeholders of a MSWM system – A pilot study of Maputo City. Environmental Development, 0–1. dos Muchangos, L. S., Tokai, A., & Hanashima, A. (2017). Application of material flow analysis to municipal solid waste in Maputo City, Mozambique. Waste Management & Research, 35(3), 253–266. dos Muchangos, L. S., Liu, Y., & Li, B. (2014). Comparative study on municipal solid waste management systems of Maputo City, Mozambique and Chongqing City, China. African Journal of Science, Technology, Innovation and Development, 6(4), 323–331.